ARRAS, France -- One serves in the Air Force, another recently served in Afghanistan in the National Guard, another is studying physical therapy in California - and all three Americans are being hailed as heroes for tackling and disarming a gunman they happened to encounter on a high-speed train between Amsterdam and Paris. Air Force serviceman Spencer Stone remained hospitalized Saturday after being stabbed in the attack Friday night as the train traveled through Belgium, though the Pentagon said the injury was not life-threatening. A dual French-American citizen was also wounded as he was hit by chance by a gunshot on the train, which eventually stopped in Arras in northern France, French Interior Minister Bernard Cazeneuve said. Cazeneuve, speaking to reporters in Paris on Saturday, said that the suspect may be a 26-year-old Moroccan flagged by Spanish authorities last year for links to Islamic radical movements, but the identity has not been 100 percent confirmed. An official linked to Spain's anti-terrorism unit said the suspect lived in Spain until 2014, then moved to France, traveled to Syria, and then returned to France. He spoke to The Associated Press on condition of anonymity because he was not authorized to be identified by name. French authorities are questioning the attacker and are expected to speak to at least one of the Americans on Saturday about what happened. Counterterrorism police are leading the investigation, according to the Paris prosecutor's office. The Belgian federal prosecutor's office has also opened an investigation into the incident on the grounds that the suspect had boarded the train in Brussels, said spokesman Eric Van der Sypt. He said Belgian authorities are assisting the investigation, which is led by France. Cazeneuve said the violence began when a French passenger ran into the heavily armed suspect while trying to enter a bathroom and the gunman fired a weapon. Cazeneuve said the Americans "were particularly courageous and showed great bravery in very difficult circumstances," and that "without their sangfroid we could have been confronted with a terrible drama." A British passenger also helped subdue the attacker. Cazeneuve called for caution before jumping to conclusions. French authorities are on heightened alert after Islamic extremist attacks in January left 20 people dead, including the three gunmen. In June, a lone attacker claiming allegiance to Islamic radicals beheaded his employer and set off an explosion at an American-owned factory in France, raising concerns about other scattered, hard-to-predict attacks. Anthony Sadler, a senior at Sacramento State University, was traveling with childhood friends Stone, of Carmichael, California, and Alek Skarlatos, a National Guardsman from Roseburg, Oregon. "I saw a guy entering the train with an AK and a handgun," Skarlatos told CBS News, "... and I just looked over at Spencer and said, 'Let's go. Go,' and he jumped up, and I followed behind him by about three seconds. Spencer got to the guy first." Stone grabbed the suspect by the neck and tackled him to the floor, CBS News correspondent Jonathan Vigliotti reports. The gun was fired, but Skarlatos disarmed the attacker. Sadler then helped Stone administer first aid to injured passengers. "We saw that a man's throat had been slit, and he was bleeding profusely," Sadler told CBS News. British passenger Chris Norman told French television that he helped tie the gunman up. Throughout the brief but terrifying episode, Sadler told the AP, "The gunman never said a word." Sadler said French authorities were to speak with him Saturday in Arras, where scientific police circulated around the cordoned-off train and train station. The Pentagon confirmed that "one U.S. military member was injured in the incident. The injury is not life-threatening." President Obama was briefed on the shooting, and said in a statement, "While the investigation into the attack is in its early stages, it is clear that their heroic actions may have prevented a far worse tragedy." Stone was to undergo surgery but he is doing "relatively well," Arras Mayor Frederic Leturque told the AP Saturday. Skarlatos, 22, had returned from a deployment in Afghanistan in July, and Stone is stationed in the Azores, according to Skarlatos' step-mother Karen Skarlatos. She spoke with her step-son immediately after the incident. "He sounded fine, but he was intense - he sounded like he had just thwarted a terrorist attack." "Alek and Spencer, they're big, brave, strong guys and they decided they were going to tackle him. And they did," she told the AP from Oregon. "Spencer got a couple good slices on him. But they were able to subdue him while the train was still moving." The Arras mayor praised the "extraordinary reflexes" of the Americans and awarded them special medals overnight. "I wanted them to feel recognition not only from the city but also from French people in general and from all people who are against terrorism," he said. "We avoided the worst, but the situation was tough, for them and for everyone," he said. The attacker did not fire his automatic weapon but wounded one man with a handgun and the other with a blade, said Philippe Lorthiois, an official with the Alliance police union. 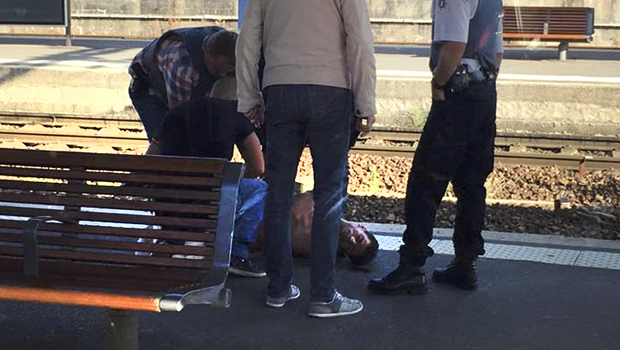 A third person, French actor Jean-Hugues Anglade, suffered a minor injury while activating the train's emergency alarm, Lorthiois said. The suspect is a 26-year-old Moroccan, according to Sliman Hamzi, an official with the Alliance police union who spoke on French television i-Tele. European police agency Europol has offered its support to the investigations. Europe's major rail stations, such as Paris' Gare du Nord and Brussels' Gare du Midi, are patrolled by soldiers armed with rifles, but passengers can board most high-speed trains without passing through metal detectors or having their bags searched or showing their passports.